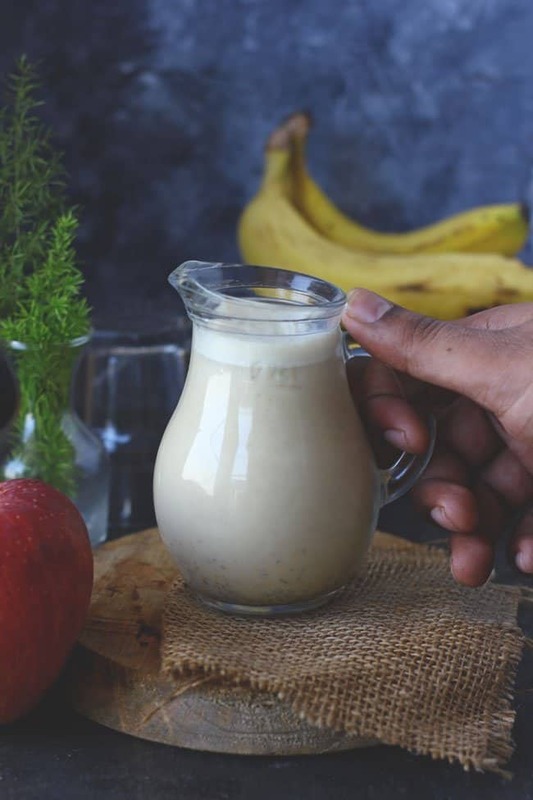 Breakfast Smoothie is one my quick go-to breakfast option.This Breakfast Smoothie is sweet and creamy with a milkshake-like consistency. And why not? It has all pulpy fruits – banana, mango, and strawberries. It is super healthy too. The goodness of all of my favorite fruits gets combined in this delicious breakfast smoothie recipe. Apart from making cake and cake out of fruits, we do add them to smoothies too. The sweetness of banana and mango is enough to sweeten up the smoothie but if still, you need a little sugary kick, add a teaspoon of honey. But stay away from sugar. Smoothie and sugar are not a great combination. I am tempted to make breakfast popsicles out of this smoothie, maybe later during the summer. Colorful, seasonal fresh fruits are in season, and I’ve been buying them in huge batches. Adding them to our salads, raita, smoothie, and desserts. We are eating fruits, left, right and center. They add fruity goodness to any dish they come around. Like strawberries, we are stripping their green heads and freezing them for don’t know what, but still freezing them. Mangoes are having an early season this year. And we are not complaining about this at all. After all, they are king of fruits and who doesn’t love to have a bit of royalty. The banana, mango, and strawberry all blend together, tasting vaguely tropical and we have been drinking this combination every day. 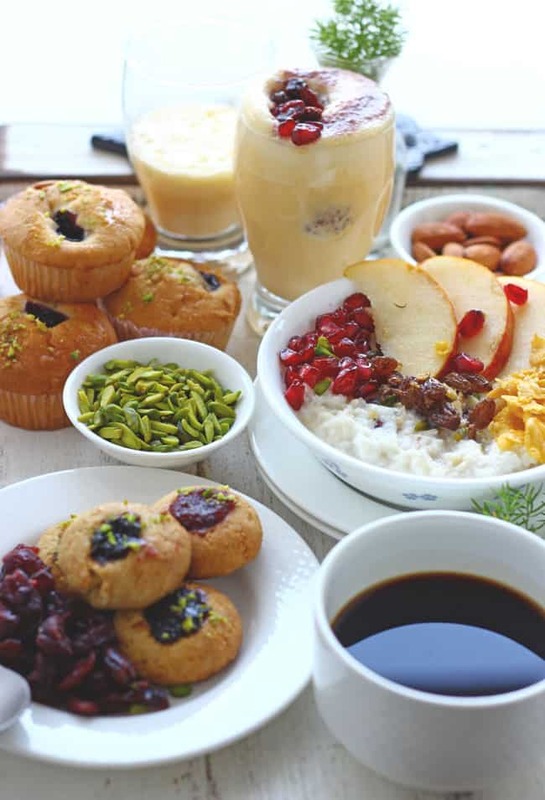 During summers, the breakfast menu in our house is altogether altered. We stay away from heavy, greasy breakfasts as much as possible. Overnight Parfaits and smoothies are currently in-house favorites. And it is technically, more of a D-I-Y kind of breakfast, so that means I don’t have to spend much time in the kitchen during the morning. Rather I devote that time to go out for a walk, swim or share with the world the stories of his office lunchbox via Instagram. For more fun, FOOD in your life, follow me on Instagram or subscribe to receive posts via email. 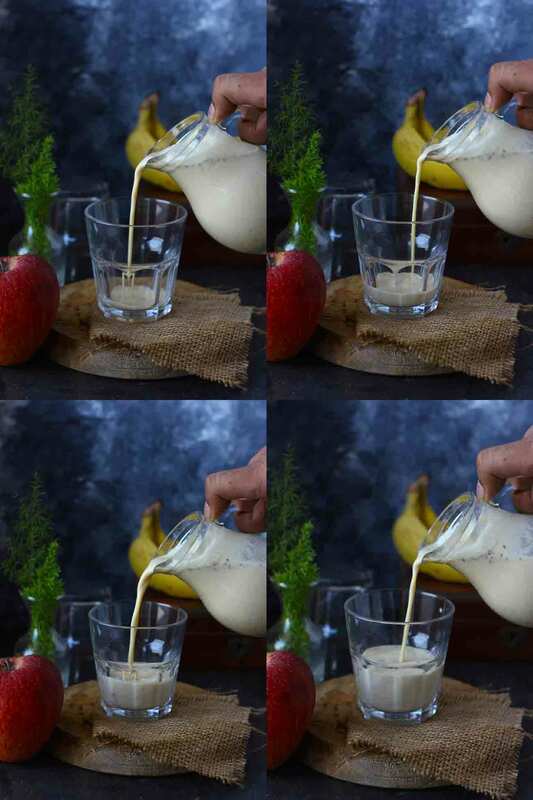 Until then, try out this Breakfast Smoothie Recipe. This Breakfast Smoothie is sweet and creamy with a milkshake-like consistency. Chop all the fruits and keep them in the fridge in a ziplock bag for 30 minutes. You can keep the fruits in the freezer overnight for the better results. 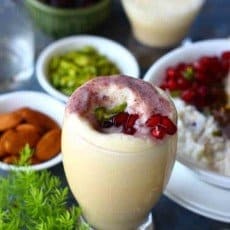 Frozen fruits make so much better smoothie specially during summers. But it is totally optional. 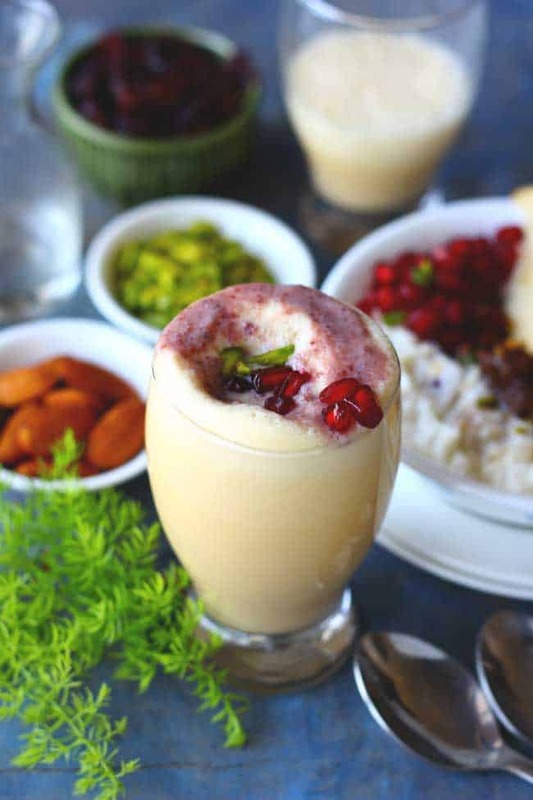 Place the fruits, milk, yogurt and honey in the blender. Blend until smooth and frothy. Pour into the serving glasses.